Whether you are building a new boat or refitting your current one, David’s Custom Trimmers can sort out all your upholstery needs. Our team can create stylish interiors using leather or macro suede for comfort and entertaining or more robust interiors for racing and working boats. We can create or re-cover lounges and helm seats in a wide varity of colours and designs to suit your needs. Lounge cushions be plain and simple or be made with knee rolls and lumber support for comfort. 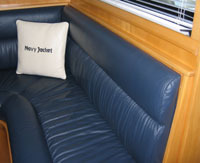 We also create or re-cover all exterior boat cushions from flybridge and cockpit cushions to day loungers. All materials are sun and weatherproof to ensure that they can stand up to many years of use. 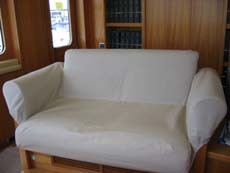 Flow through foam is also used to ensure that cushions do not hold water. 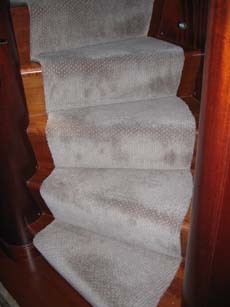 A comfortable mattress is essential to making your boat livable. 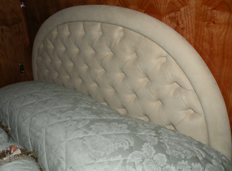 We tailor your mattress to suit your needs by combining different foams of various densities and thicknesses. Bunks can be covered in a range of materials including patterned, padded and fire retardant mattress fabrics. If you are looking for something special then we can create feature panels to break up a plain wall or draw attention to a point in the room. Techniques such as Deep Diamond Buttoning can really finish off the classic styling of your boat. Wall Linings, Head Linings and Flooring. 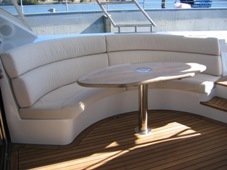 We can cover all of the interior surfaces of your boat with a wide range of materials in a vast range of colours. These include vinyl, macrosuede and leather wall linings, vinyl head lining boards, marine carpets, plush carpets and clear protective carpet covers. There are also plenty the accessories to go with your upholstery. These include throw cushions, loose fitting covers, lee cloths, protective coverings and almost any other upholstery products you could think of.